The 19th FNB Dance Umbrella runs from February 17 to March 17, 2007 at several venues in Johannesburg: The Wits Theatre, Jorissen Street, Braamfontein; The Johannesburg University Theatre Complex, Auckland Park and Constitutional Hill in Braamfontein. The FNB Dance Umbrella 2007 will be a highlight on all dance-lovers’ calendars. It will feature 25 programmes of work representative of all forms of contemporary choreography and dance in this country. 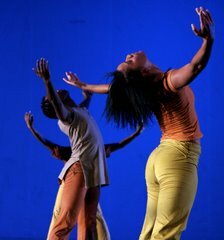 Included in the FNB Dance Umbrella 2007, are the following commissioned works. The opening programme on Friday and Saturday February 23 & 24 at 19:00 at The Wits Theatre features three commissioned works from young artists: Daniel Mashita will premiere his new work called 2 Soul’z. He is joined by Moving into Dance company member Thabo Rapoo with a work called xiif-hunger. Programme 4 is on February 23 @ 24 at 20:30 in The Wits Downstairs Theatre and it features Tossie van Tonder in a new work alfabet. This work is an autobiographical portrayal of the artist’s life and reflects on her role as a mother and a dancer. Programme 6 is in The Wits Theatre on February 26 & 27 at 19:00. It features First Physical Dance Theatre performing a new work Go from Gary Gordon who is based in Grahamstown. This work also reflects on the artist’s life and the changes in the last years. 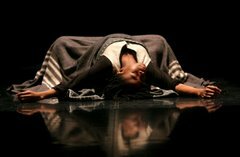 Programme 7 on February 26 & 27 at 20:15 at Wits Downstairs Theatre, is a collaborative work between German choreographer Gerda Konig and Kenyan artist Ondiege Matthew. CounterCircles looks at living life in a isolated cage and also features disabled dancers. Programme 8 is on February 28 and March 1 at the Wits Theatre at 19:00. Swiss Dance Company Cie Linga present a work titled emballe-moi (wrap me up). In this piece the choreographers and performers throw a light on the seducing techniques of Advertising, at the service of the consumer society. Programme 9 is on February 28 and March 1 at 20:30 with a work called 6 minutes by Peter van Heerden. Using elements from a live art installation, the artist investigates the fact that through mans continued struggle with himself and his masculinity, atrocities will continue to be committed. Programme 11 is at the UJ Arts Centre on March 3 & 4 at 18:00. Encounters by Gladys Agulhas, explores and expresses the various emotional and physical life journeys of people. Programme 12 is on March 3 & 4 in UJ Arts Centre at 20:00 and features Durban-based Musa Hlatshwayo with a work called Umthombi. This dance theatre narrative follows a metaphoric journey of a young man to manhood and his traditional identity. The second work on this programme is Impro-Vise_2 by Andreya Ouamba from Burkina Faso which won the African Indian Ocean Choreography Competition 2006. 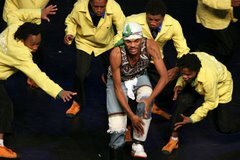 Programme 18, is on March 9 & 10 at 19:00 in The UJ Arts Centre and features a collaborative work between South African Company Via Katlehong and French company Back to Hip-Hop. Wola-Baba is the meeting of two different cultures with backgrounds in Africa versus Europe. This work received a Dance Forum Grant. Programme 19 is a double bill programme on March 9 & 10 at 20:30. Sylvia Glasser presents her controversial work Blankets of Shame with the Moving into Dance Mophatong Company. This work lifts the blankets of silence, stigma and denial that hide women and child abuse. Sharing the programme is a new collaborative work from Sifiso E. Kweyama from South Africa and Tumbuka Dance Company director, Gilbert Douglas called Muramba. Programme 22 on March 14 & 15 in UJ Arts Centre features Gregory Maqoma with the final work in his “Beautiful trilogy”, Beautiful Me. Here Maqoma challenges the notion of dance by working with three very successful artists Akram Khan, Faustin Linyekula and Vincent Sekwati Mantsoe. Programme 23 is a work by Ina Wiechterich called Jampass, created for the Remix Dance in Cape Town. Directed by national and international award winning artists Jaco Bouwer, this work takes place in Constitution Hill on March 16 & 17 at 18:30 and 20:00. Programme 24 is at The Wits Downstairs Theatre on March 16 & 17 at 19:00. The commissioned work on this programme is Open White, Fade to Black by Timothy le Roux. His work explores the role of the “colored” woman in South Africa. Le Roux was one of the Dance Forum Grant recipients. The final Programme 25 is at the Wits Theatre on March 16 & 17 at 20:30. The two recipients of the Phillip Stein Grant, Constance Kau and Mlu Zondi will present the new works they have created with the grant. Tickets for the festival can be bought from Computicket and prices range from R20,00 to R80,00. Concessions/block bookings and subscription tickets are available. Visit www.artslink.co.za/arts for updated programme schedules. The FNB Dance Umbrella 2007 has been made possible with assistance from First National Bank; the National Lottery Distribution Trust Fund; The French Institute of South Africa; CulturesFrance; French Cultural Centre, Mozambique; the Goethe Institute of Johannesburg; Business and Arts South Africa; the National Arts Council; Pro-Helvetia Swiss Arts Council and the Gauteng Department of Sport, Recreation, Arts & Culture.